It looks like a perfectly healthy tree, but trust me….it wasn’t. And, it was precariously close to the house. So, down it went….a nearly 60 foot tree. Unfortunately, it just HAD to be done. We had eleven trees removed from our property today. I have never had to have trees removed from my yard before; heck, I’ve never even had a yard of this size with nearly a forest surrounding my home! 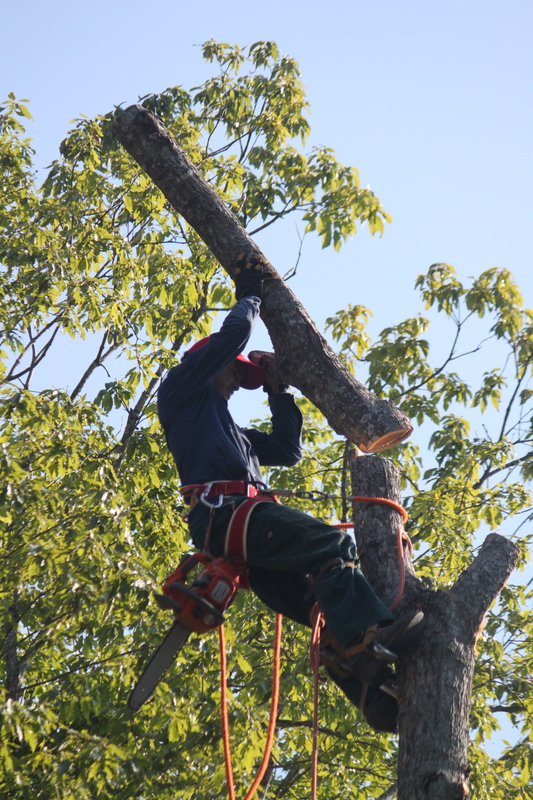 So, being new to the area, I signed up for Angie’s List and within a week had several estimates for our tree removal work. The winning company (A Beautiful Tree) did a fine job of removing the various dead and diseased tress. I confess that on the “bliss-o-meter” it’s nearly a “10” for me. Here’s why: I’ve had a life-long fear of big trees, especially ones anywhere near my house. Well, I have a life-long fear of many things…but today we’re just talking about trees. When I was thirteen and living in Colorado, a dear family friend was killed by a tree branch falling on him after heavy snow (his skull was literally bashed-in). During intense late summer storms trees have crashed through the roofs of homes just around the block from me when I lived in Northern Virginia….and not long ago during a visit to the Hawaiian Art museum in Honolulu, a group of us witnessed a large palm tree uproot itself on a blustery day and come crashing down on the roof of a car trapping the driver still in it. Mercifully, a nurse was among us that day. She ran to the driver who was all covered with glass mixed with his blood and was able to assist until EMT’s arrived just five minutes later. Fortunately, the driver did not suffer life-threatening injuries but still, it was a harrowing experience for everyone and of course made me renew my vow to never have trees planted near my house. Fast-forward to now….I live in a new house surrounded by 50 foot trees! Let me be clear; as much as it would have made hugely ecstatic, we did not remove ALL the trees. Yes, on the bliss-o-meter that would have been a plus -10 for me! But it would not have been the right thing to do, of course! I could not, in good conscience, kill perfectly healthy trees. And, to be frank, it would have been cost prohibitive….the job was already a $3400 drain on the pocketbook. Instead, we removed only those that were obviously quite dead and close enough to the house to do significant damage in a storm….and those that were diseased. Who knew that cross-contamination occurs in the tree world as well as at the kitchen sink?! So, our yard is less eleven trees and really, it seems we didn’t make a dent in the tree population. We still have plenty of trees! I can rest a little better tonight though knowing that the worst of them are gone…. So for today….I’d say I’m quite content.